April 16, 2019: The two boards that conduct the class 10th and class 12th exams in Telangana, the Telangana Board of Secondary Education and the Telangana Board of Intermediate Education released the time tables for both the exams in the last quarter of 2018. The Telangana State Board SSC exam will be conducted between 16 March 2019 and 2 April, 2019 and the Telangana State Board Inter I & II Year exams are being conducted currently starting from 28 February, 2019 and ending on 18 March, 2019. The timetable for the SSC exams can be found here and those for the Inter exams can be found here. Telangana Board of SSC and Intermediate Education has successfully completed the board examinations. TS Board SSC and Inter results will expected in this week. TS Inter 1st and 2nd result to be declared on 18 April, 2019. Last year, the Telangana board results were announced in May and April. This year, too, the Telangana board result 2019, is expected to be announced around the same time. Examresults is constantly on the top of things and will update the exact time and date of the Telangana State Board exam results announcement as soon as the information is available to us, as released by the relevant board authority. Along with the Telangana board results, we will also conduct an analysis of the exam and release information such as pass percentage, gender-wise percentage, division-wise pass percentage and also name-wise results, name of toppers, etc. 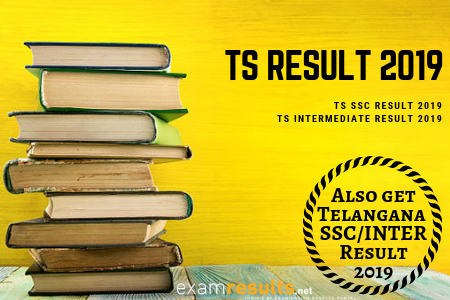 Previously we published the TS SSC results and TS Intermediate results on our website, examresults.net/telangana/. Along with the Telangana board results, we will also conduct an analysis of the exam and release information such as pass percentage, gender-wise percentage, division-wise pass percentage and also name-wise results, name of toppers, etc. Type the desired state name, for example, examresults.net/telangana/. Look for the desired board button, for example the button that says TS SSC Results or TS Inter Result Click Here. Click on the link and fill in your details, including Registration Number and Date of Birth, to get your Telangana Board Result 2019. Take a printout of your Telangana Board Result 2019. You can also download our app on the Google play store to check your results. Traditionally, the Telangana SSC results are announced in either the first or second week of May. This year, too, the trend is expected to be maintained. Similarly, the Telangana Intermediate results 2019 are expected to be announced in the third or last week of April as is the trend with the Telangana state board exam results announcement. In the table below, you can check the pass percentage for the past three years for both class, the Telangana SSC exam and the Telangana Inter exam. We will update this table with the pass percentage for 2019 once the Telangana board results for this academic year are out. Whether you have just received your TS SSC results 2019 or your TS Intermediate Results 2019, the one question on your mind would be, "What next?". Get answers to all your questions on our sister site, IndiaEducation.net, with articles like Options to Pursue After 10th and 12th. Students who've appeared for the Telangana BSE 2019 and Telangana Inter exams 2019 can check their TS Intermediate results 2019 TS BSE result 2019 on the official websites of the Telangana board, bse.telangana.gov.in, bie.telangana.gov.in or on examresults.net. You can also download our app on Android phones and stay abreast of the exam- and results-related information and check your results. To check your Telangana state board exam results and other examination updates, bookmark this page using the keyboard shortcut Ctrl + D. All the Best! The State Board of Telangana, i.e. Telangana Board is divided into two sections according to the examinations it conducts. The Telangana Board of Secondary Education conducts the SSC exams and the Telangana State Board of Intermediate Education conducts the Intermediate exams, i.e. 11th and 12th. The Telangana Board of Secondary Education (TBSE) was established in the year 2014 and is both public and private in nature. It organizes the 10th/SSC level exams for students of Telangana and also publishes the results. The Telangana Board Results 2019 will also be published by the Telangana Board. The website for Telangana Board of Secondary Education is bse.telangana.gov.in. The Telangana State Board of Intermediate Education (TSBIE) was established under the Telangana State Government in the year 2014 and it is situated at Nampally, Hyderabad. The TSBIE organizes and manages all the Intermediate level exams including 12th standard exams. It also publishes the Telangana Board Result for all the students appearing for the Intermediate exam. The website for The Telangana State Board of Intermediate Education is bie.telangana.gov.in. The Telangana state board exam results for both the boards are available on examresults.net/telangana/.